Very Good. 0006470653 ALL BOOKS SHIPPED WITHIN 1 DAY OF PURCHASE! Very Good. 0006470653 1991 edition. Can you put the puzzle box down? I have been a fan of Clive Barker since reading Imagica a couple years ago. Barker can write some truly imaginative books. He is one of the authors that breaks the mold of our commercial carbon copy writing industry. I knew that if I was going to ever see myself a fan of his works I had to read Hellbound Heart. 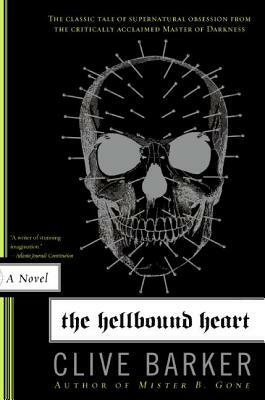 This is the book that started the whole Hellraiser movie series. If you ever saw the movies you know how hard it is to forget ?pinhead?. First and foremost you don?t have a clear description of any Cenobite that reflects the pinhead character except for the reference to ?the engineer?. With that said don?t buy this book just for pinhead, you?ll miss the point. The book is very short (between 150-170pg depending on your edition) so reading it in a single sitting is not hard to do. It took me two days to read it. This book was amazing! The way Clive Barker describes the human heart with its lust and desires Often the heart is drawn despite the fact that what you may desire can harm your soul (or torture it) is the underlying theme that makes this story so powerful. The author also has a great way of describing the atmosphere. There is a paragraph at the start of one of the chapters that describes the way seasons over take each other with a violent submission that is similar to the submission patterns of the characters. This is a great classic and should be read by any horror fan. A great short story I give it 5 of 5 stars! This book is gold. Not only does it have the creepiest of villians in existence the entire book is creepy. The narritive is quick, not letting the reader become too comfortable. This is much better than the Movie version( Hellraiser). The use of british slang confused me at times, but besides that i found the whole thing to be a complete delight.